Home › Advocacy › Follow the rules, obey the signs, motorists! Follow the rules, obey the signs, motorists! Follow the rules, obey the signs, motorists! In the Oaks Park, in the London Borough of Sutton, there is a new shared path. It is a vast improvement over the previous rough, unmade surface on this stretch of National Cycle Network route 20 and the Avenue Verte to Paris. As the pix show, it is great for cyclists, pedestrians, people using baby buggies, wheelchairs etc., etc. All praise to the London Borough of Sutton and the parks managers for doing this…. However there is a problem. As you can see, the path is wide. It is marked with shared used signs on bollards every so often and there are the usual, if ambiguous, cycle silhouettes on the surface. If cyclists and pedestrians are considerate- and most of the time they are – this can work very well in circumstances such as this. The problem is that there are other road users who are not considerate. The problem? Motorists in cars are using this path to drive up and down the adjacent car park, instead of keeping to their side of the route. And the shared path is probably not built to carry their weight. And they drive straight at you as a cyclist, expecting you to get out of the way. Do they do that to pedestrians too? Is it a design issue? Can the signage be improved to make it clear to motorists that they are driving up what is in effect the pavement? 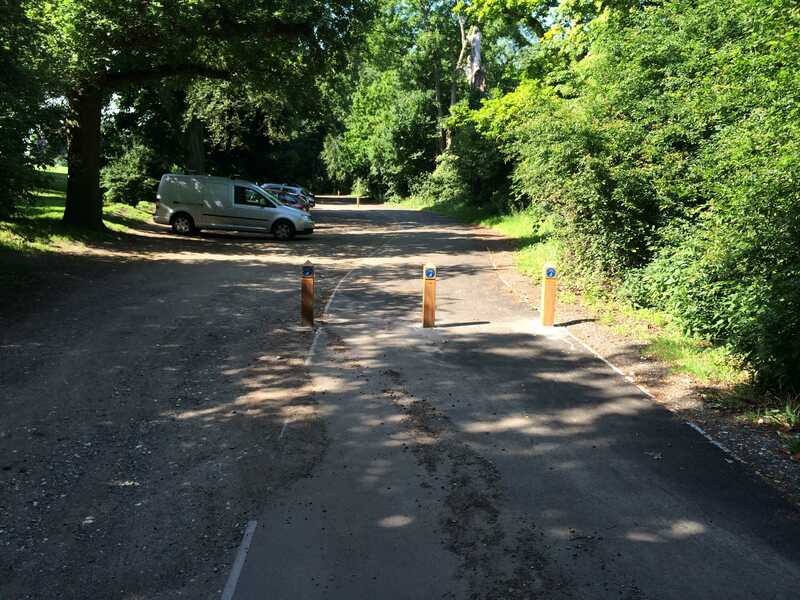 What a shame that good intentions are subverted by motorists who don’t like driving up a bit of unmade road- the same unmade road that pedestrians and cyclists had to struggle with before and that was a complete no-go area for baby buggies and wheelchairs. If only motorists would obey the Highway Code! The good news is, as you have pointed out John, that the path is now in place. I also think it’s good that it is as wide as it looks from your photos – this means that when it gets busy it won’t get congested. (And when will it get busy with people on bicycles? Well, when there are good safe cycle routes to and from the park – but that’s a different story at the moment). And where else in the borough is there anywhere where the path for bicycles has a smoother surface than that for motor traffic on the adjacent carriageway? If only! But yes, it does appear a little bizarre that no one appears to have expected at the design stage that drivers would, if given the opportunity, prefer to use a smooth surface than a rough one. 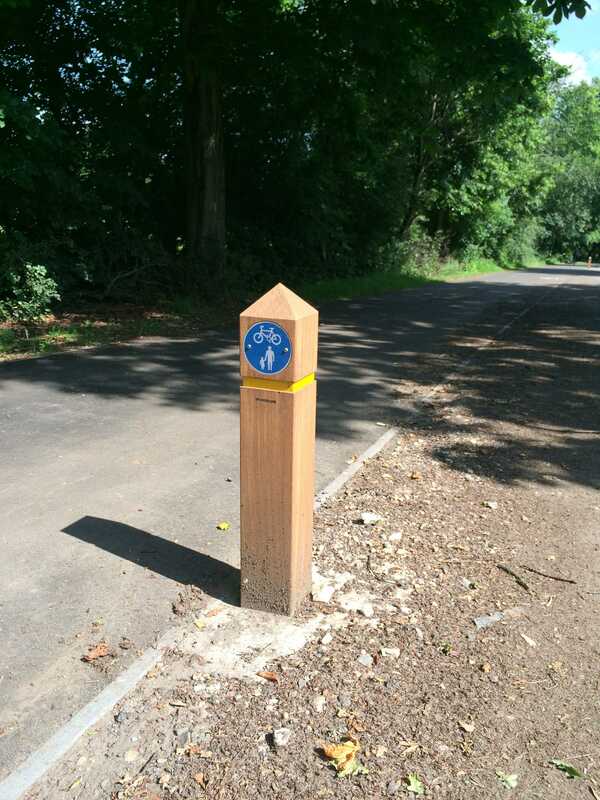 I can only think that perhaps the project has not quite finished yet, and that more posts (or wands) are to be installed to define the edge of the shared path and give true space for cycling. On the other hand, it could just be a project that has surreptitiously used funding intended for cycling to provide a more drivable surface for all vehicles. I am sure we will find out in due course.